What's in a name? Where do bird names come from? For some birds the name describes what the bird looks like, for example greenfinch, or a feature of the bird like crossbill or the behaviour of the bird, for example treecreeper or the call of the bird like cuckoo, but for others the names are mysterious like puffin or godwit. Time with a good dictionary like the Concise Oxford Dictionary or a good internet search engine like Google can reveal the origin of many bird names and the connections between English and a whole range of other languages. Latin is behind a wide range of bird names. Here are some examples. 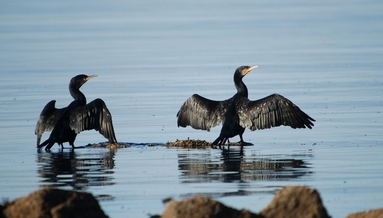 Cormorant comes via the Old French "cormaran" from medieval Latin "corvus marinus", sea-raven. 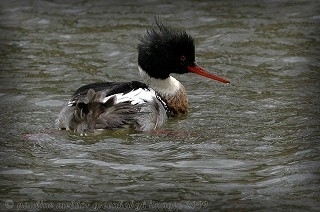 Merganser is a diving goose, from "mergere", to dive and "anser", a goose. Peregrine is the wanderer from abroad, the foreigner - originally the person or animal that has travelled "per agrum" - through the fields. There are also examples from the Romance languages, like linnet from Old French "linette", referring to lin, or flax, and the linseed enjoyed by the bird. Curlew, too, comes from the Old French "courlieu". Many bird names seem to have their roots in northern European languages. Anglo-Saxon is the origin of lapwing, from "hléapan", to leap which refers to the way it flies. The Germanic bird names include redstart - "staart" is Dutch for tail and a feature of these birds is their red tail. Fulmar from the Old Norse "full", i.e. foul, with reference to its smell - they can project the oily fishy contents of their stomach over would be egg thieves - together with "mar", meaning sea. Arran is internationally important for its breeding Hen Harriers. Harrier from to harry. The Old English is "hergian" to torment with hostile attacks. That is a great word that just about begins to describe the harrier's method of hunting. Ptarmigan comes from the Gaelic "tarmachan", plus a pseudo-intellectual initial "p". What about wheatear, a bird with a very distinctive white rump? Originally it was called "whitearse". That sounds Anglo Saxon! As well as local names all birds have a unique scientific name that is universally recognised. For example hobby comes from Old French "hobet", a small bird of prey. Its scientific name is falco subbuteo. Subbuteo? I remember that as a table top football game but I did not know then that it was Latin for hobby. Another more familiar bird of prey is the Kestrel falco tinnunculus meaning "little bell ringing falcon". I have not a clue what that is about. The origin of some of these scientific names takes us into another dimension of "What's in a name?"